A key measure of consumer spending – retail sales – grew more than analysts expected in October and recorded its biggest back-to-back gain since 2014. The Commerce Department reported that 11 of 13 retail categories had higher sales in October. Even excluding volatile automotive sales, retailers showed health advances with a year-to-year increase of 4.3%, which is about the average for the last 20 years. Business inventories rose 0.1% in September, lagging a 0.7% increase in sales, according to a separate Commerce Department report. As a result, the inventories-to-sales ratio declined for its lowest level in 13 months, an indication that businesses are better aligning stockpiles with demand, which should allow them to operate leaner. Inflation on the wholesale level was unchanged in October, a reminder of America’s moderate economic growth. The Bureau of Labor Statistics said that even excluding volatile food and fuel costs, the Producer Price Index rose 1.6% from October 2015, the highest in two years. Lack of inflation is one sign of economic weakness that has allowed the Federal Reserve to continue keeping interest rates near record lows. The Fed has said it would like to see inflation around 2%. The Federal Reserve reported that industrial production was unchanged in October, although manufacturing output rose for the second month in a row and the fourth time in five months. Declining utility production, related to unseasonably warm weather, dampened output overall. 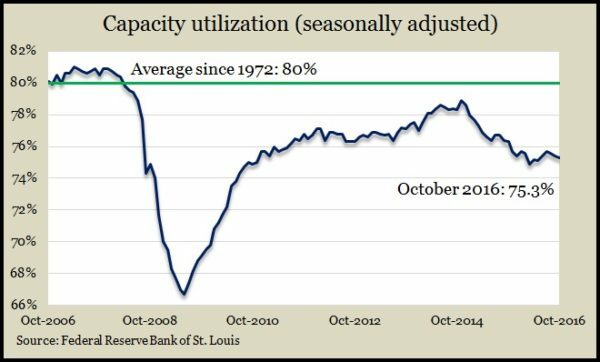 Capacity utilization declined the third month in a row straying further below the long-term average, above which economists begin to worry about inflation pressure. As analysts expected, the broadest measure of inflation increased for the third month in a row in October. The Consumer Price Index rose by its highest level in six months progress since a decline in February. The Bureau of Labor Statistics reported that core prices – excluding food and energy – rose 2.1% from October 2015, a slight decline from the year-to-year core inflation rate in September. The moving four-week average for initial unemployment claims fell for the first time in five weeks, when it reached a 43-year low. The Labor Department indicator is 29% below the historical average, which suggests employers continue to be reluctant to let workers go. That could boost hiring and wages, which should fuel more consumer spending, resulting in more economic growth. The choppy recovery in U.S. housing continued in October with housing starts rising 23% from their pace in September. Single-family houses, which make up almost two-thirds of new houses, started at their fastest pace in nine years, before the recession, according to Commerce Department records. Building permits for future construction weren’t as robust, rising 0.3% from September. The Conference Board reported that its index of leading economic indicators rose in October, for the second month in a row. The 0.1% gain, following a 0.2% increase in September, suggests continued moderate economic growth at least through the beginning of 2017. The business research group said the spread in interest rates and the number of average work hours helped offset a recent rise in unemployment claims and weakness in business investments.